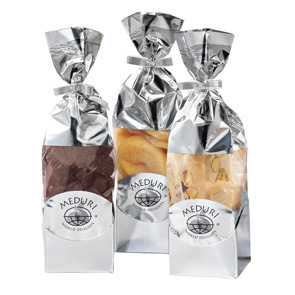 These silver mylar pouches are filled with succulent Meduri all-natural dried fruit and mixes. This Exclusive Sampler set features six ounces each of Strawberry-Rhubarb Bites and Premium Apple Mix plus 12 pieces of Blueberry & Almond Nougats. Take a moment to shop all of the fabulous Fruit Sampler Sets available from Meduri World Delights.